Just Press Record is the ultimate mobile audio recorder bringing one tap recording, transcription and iCloud syncing to all your devices. You can even start a new recording completely hands-free with Siri! Life is full of moments we would rather not forget - like your child’s first words, an important meeting or spontaneous idea. Capture these moments effortlessly on iPhone, iPad or for ultimate convenience, Apple Watch. 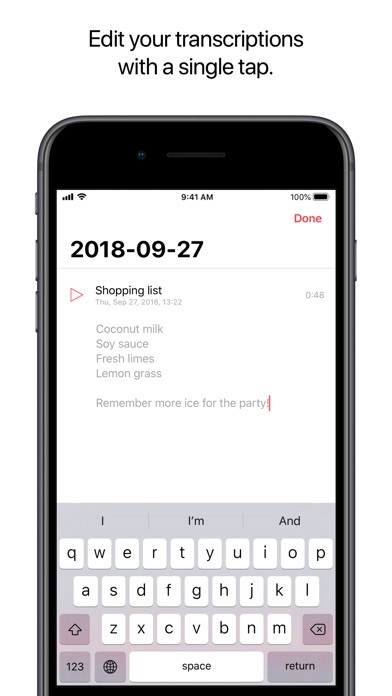 RECORD • Use a Siri Shortcut to start a new recording. • One tap to start, stop, pause and resume recording. • Unlimited recording time. • Record discretely in the background. 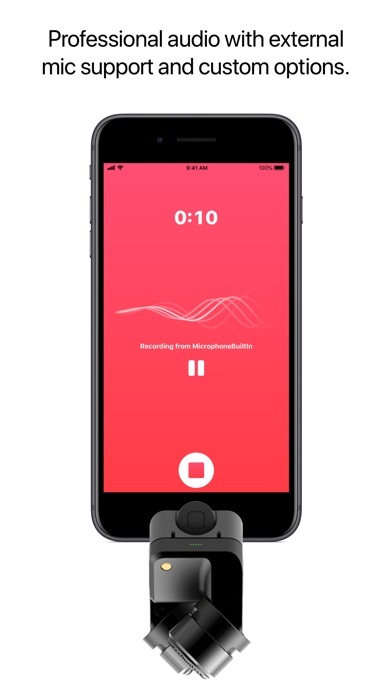 • Choose to record from the built-in mic, AirPods or external microphones. • Start and stop recording from the Lock screen widget, with a 3D Touch Quick Action or via the URL scheme. 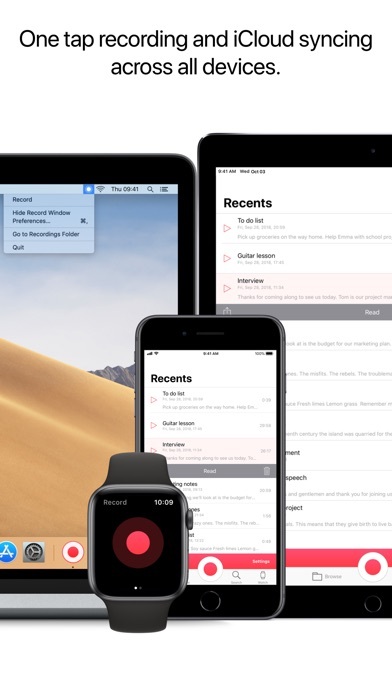 • Record independently on Apple Watch and sync later. PLAY • Seek backwards and forwards during playback. • Adjustable playback speed. TRANSCRIBE • Turn speech into searchable text. • Edit your transcriptions right inside the app. • Support for over 30 languages, independent of your device's language setting. • Format as you record with punctuation command recognition. SHARE • Share audio and text to other apps on your iOS device. • Share to iTunes on Mac or PC via the Lightning Port. ORGANIZATION • View recent recordings or browse your library by date and time. • Search by filename or transcription content. 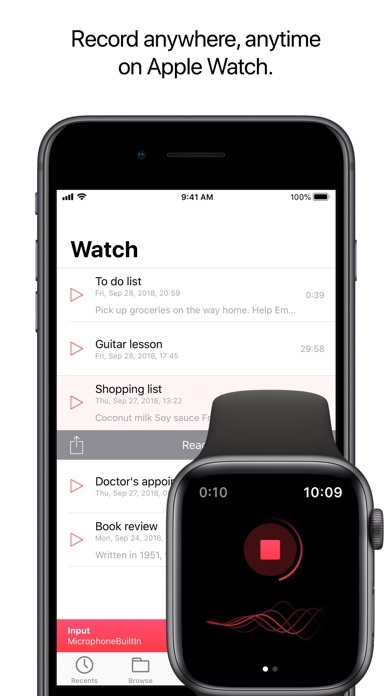 • Dedicated tab for quick access to recordings made on Apple Watch. • Peek and Pop the contents of folders in the Browse tab. • Rename recordings. • Slide Over and Split View support on iPad. STORAGE • Choose to store recordings either in iCloud Drive or locally on-device. • Recordings stored in iCloud Drive automatically sync across all your devices. • Transcriptions are stored within the audio file. PRO-AUDIO • Support for high quality external microphones connected via the Lightning Port. • Customizable Audio Settings to enhance your recording experience. • File types include WAV, AIF or standard iTunes M4A (ACC). • High quality audio up to 96kHz / 24-bit. ACCESSIBILITY • VoiceOver support throughout the app. • Magic Tap gesture to start / stop a recording. • Dark Mode makes the app more comfortable to use in the dark. APPLE WATCH Just Press Record includes an Apple Watch app that gives you the freedom to record anywhere, even when your iPhone is not around. • Start recording with a single tap on the Complication, or just ask Siri! • Record discretely in the background. • Unlimited recording time. • Recordings automatically transfer to iPhone for transcription and iCloud syncing. • Listen to recent recordings through the built-in speaker or AirPods. • Adjust volume with the Digital Crown. • Pause recording with a downward swipe. • Accessibility support with VoiceOver, reduced motion and support for the extra large Complication template. IMPORTANT: • Transcription requires a good, clean audio signal. Avoid recording in noisy environments and ensure the microphone is positioned close to the source. • Recording from AirPods is not available on Apple Watch. • Just Press Record for Mac is available as a separate purchase on the Mac App Store. • URL scheme implemented by Just Press Record can be found on our FAQ page. Transcribe with this app and you will come up with a brand new language. It will not help you determine anything close to what is said. Does just what it says. Couldn’t be more pleased. The app is real convenient to use UNTIL you exceed 12 recordings at which point it deletes the older ones with no warning whatsoever. A software should never lose your data. I lost a lot of recordings that way before I figured out what was happening. While recording, the call came in, the call was never answered, but recording stopped. I was unaware that recording stopped and missed important part of the lecture. Not worth to pay for the product that doesn’t provide essential task. Make recording on iPhone the transcription appears on iphone but not to icloud desktop. Just the voice file is saved to icloud. This has us very stable. It records well. But for a non-iCloud user it’s near useless. Every single file has to be manually exported, shared, even iTunes sharing takes a multi step process, and discerning the strange data stamp in order to export and then delete ONE BY ONE. No I’m sorry forget it. Just turn on automatic iTunes sharing by default? Or give a batch export option? I was recording a lesson and a phone call came in. This canceled my recording and I lost the rest. I’m going back to the stock iPhone app instead. I recently upgraded to an iPhone X, and unfortunately my wonderful voice recording app that I used almost every day was no longer supported. So I had to wander into the crowded field of recording apps to find something that would suit my needs. The main thing that I had often wished for in my other app was the ability to search audio for a word or a phrase. When I saw that Just Press Record has transcription capability, I perked up. That functionality was a nice solution to my audio search dilemma. I purchased the app and tested it out. First thing: I love the fact that I can sync with iCloud, as that will allow me to play my already-existing recordings through Just Press Record. Additionally, the transcription - though far from perfect - will most likely suffice for the search capability that I need. I was all set to settle into using this app on a daily basis when I realized that it is missing one crucial feature that I used consistently: the ability to append to an existing recording. My previous app handled this brilliantly: I’d just go to a recording, open it up, and hit the Record button. Automatically, whatever I said would be appended to the existing audio. I have been trying to do the same thing in Just Press Record, but to no avail, as pressing the record button under an open file simply starts a new recording. I’ve emailed the developers to determine if there is a way to do this, but so far have not received a response. Other than this flaw, I really like the app (it even has a dark mode, which I love). 3 stars, though, for apparent lack of ability to append. Update: One additional thing that I’ve found (and perhaps it’s been fixed) is that if I have a recording that is somewhat extensive (say, 20 minutes or longer), the transcription of that recording will not be searchable. In other words, I can create a transcription, but when I try to search on any word within it, that recording will not be returned in the list of search results. I’m assuming this is a bug (as opposed to a limitation?). Would be wonderful if this could be resolved. This works great with Apple Watch, but needs more options for automatic folders. Don’t do too many recordings in a day, so having folders for each day get cumbersome. Would really prefer an option for folders per month. Also please add option for full date in filenames. Now, having just time as filename gets easily confusing when sharing files or moving them out of folder. Last complaint, when choosing iCloud storage, files gets deleted from iPhone after upload, so needs to be downloaded again to be used later on. Please add an option for keeping file both places.